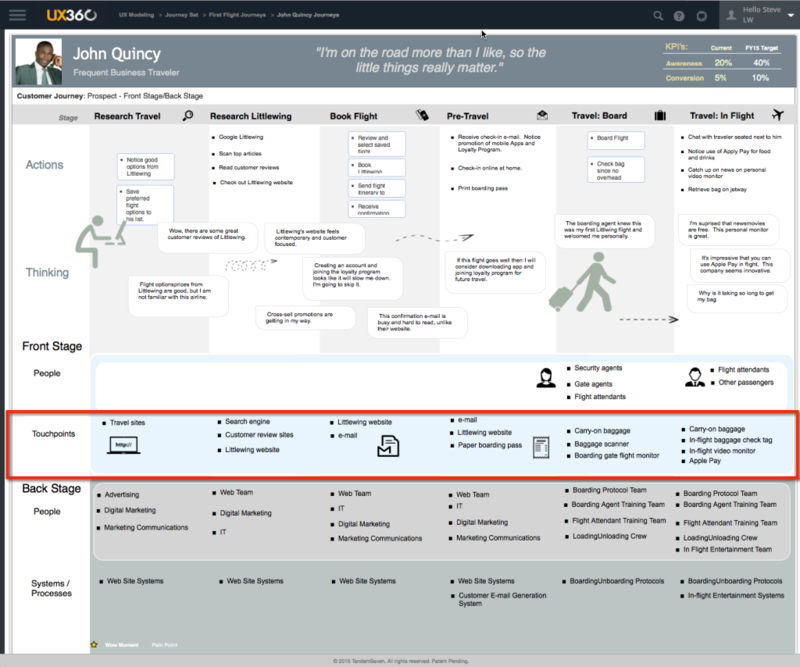 The process of customer journey mapping can take many forms. 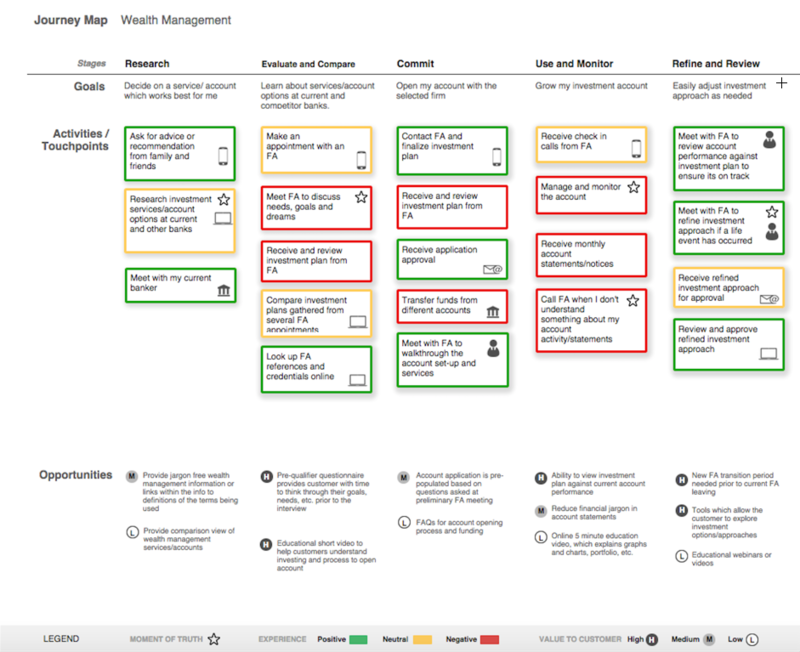 In this post we highlight some of the most effective methods, with some tips for enhancing your own journey mapping practices. 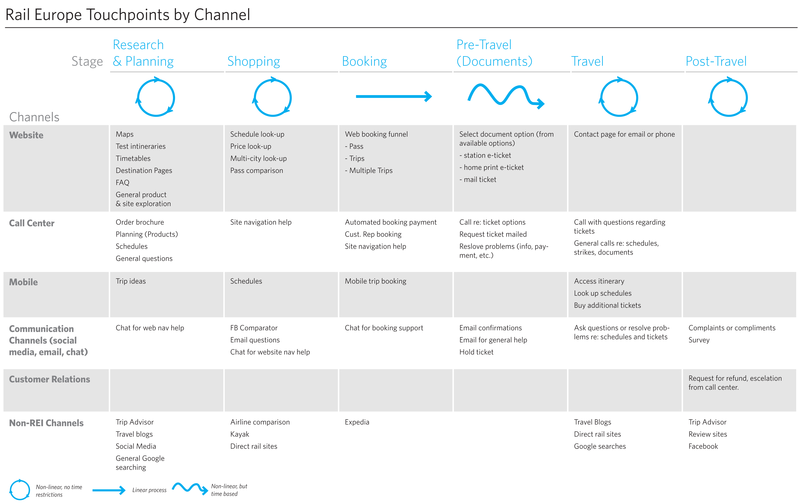 In essence, a customer journey map is really quite a simple concept: an illustration that details all of the touchpoints at your organisation that a customer comes into contact with as he/she attempt to achieve a goal, and the emotions they experience during that journey. The mapping process demands rigorous research and a meticulous understanding of the customer. If the map is to be truly reflective of what the customer experiences at a human level, corners cannot be cut. To complicate matters, no two maps will be exactly the same, with the design varying according to the business, product, service and customer being mapped out. Having said that, there are best practices that organisations should adhere to during the mapping process, and these represent useful pointers for those that are creating a map for the first time. 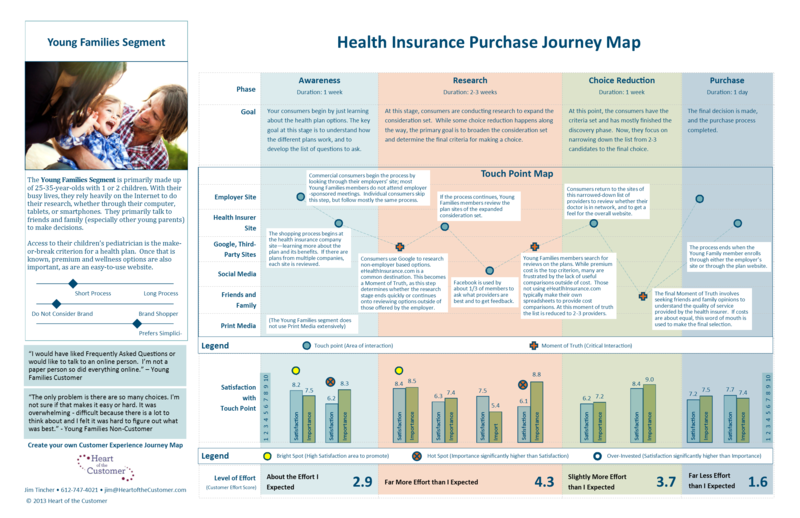 So with that in mind, let’s take a look at some sample customer journey maps and examine what we can learn from them and apply to our own mapping efforts. The data that will be used to inform that map should not be based on guesswork. Organisations should firstly identify their best customers (or the customers that they would like to attract), and make sure they thoroughly understand them, building a buyer persona for these customers, and any other customer group that is important to the business. To aid this process, it is best practice to interview these customer groups about their journeys to ensure that you understand their motivations, goals, purchasing habits and pain points. Businesses shouldn’t make the mistake of assuming they know what customers want. This map from Heart of the Customer demonstrates how the buyer persona informs the entire map, ultimately concluding how successfully this particular demographic’s journey has been. The research process should also cover your own organisation. It is important that you know how successfully each of your channels is proving, so you should also interview your frontline staff and teams that work on the touchpoints, to identify any issues or pain points that should be factored into the map. UX/digital design agency Adaptive Path begins the mapping process by first building a touchpoint inventory, based on qualitative and quantitative research. This ensures that when it comes to detailing how the customer moves through interaction and what he/she experiences, it is an accurate representation. With a comprehensive foundation of data, organisations are ensuring that they are best placed to deliver an accurate visual representation of each customer’s journey, and to identify the potential problems that can be experienced on the path to purchase. Having done your research, you should have a pretty clear idea of the processes that each of your personas go through on their path to purchase and beyond. 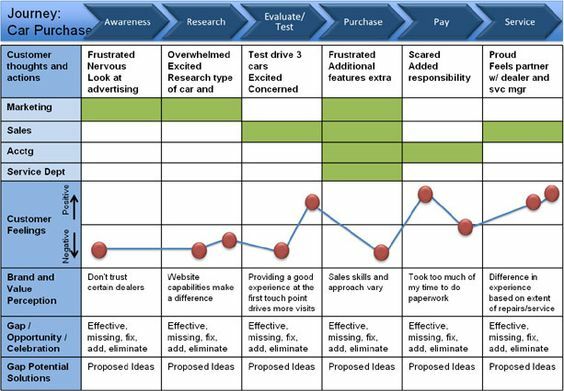 When it comes to building a map, it is important that it is organised by stages that reflect the major goals your customer is trying to achieve, rather than organising it by stages that reflect your own internal processes. Think about what your customer is trying to achieve at every step, and use the data you have from your customer interviews to inform this. 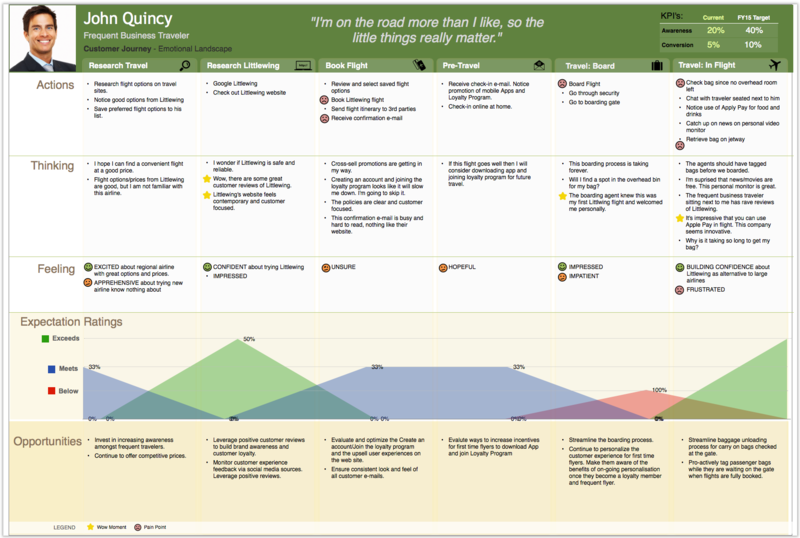 This journey map from Tandemseven clearly details the goals. As well as capturing the major goals, which characterise the stages of the map, the journey map should also try to detail more specific goals and considerations that the customer might have along the way. For instance, these might include: wanting to find out what the different options are; ensuring that he/she is paying a fair price; or seeking reassurance that he/she has all the information readily available about the flight. By capturing these goals/considerations in each stage of the journey, you are able to examine how well you are meeting those goals and answering any questions. Here is another map from TandemSeven that outlines the kinds of thoughts and goals that could be captured. At each of the stages that has been mapped out, consider where the touchpoints occur. Map out all the interactions that the customer has during his/her journey and all the potential touchpoints with your organisation that could occur. Here is a comprehensive example from Tandemseven. After you have registered all the touchpoints, you will now be able to mark out your known pain points on the journey map. Having conducted your interviews with customer-facing staff and teams that work on touchpoints, you will know where these pain points are. This will come in useful for later, when you are looking for actions to take following the mapping process. Similarly, you could highlight where you are doing a great job. This example from User Testing depicts positive and negative experiences by colour code. 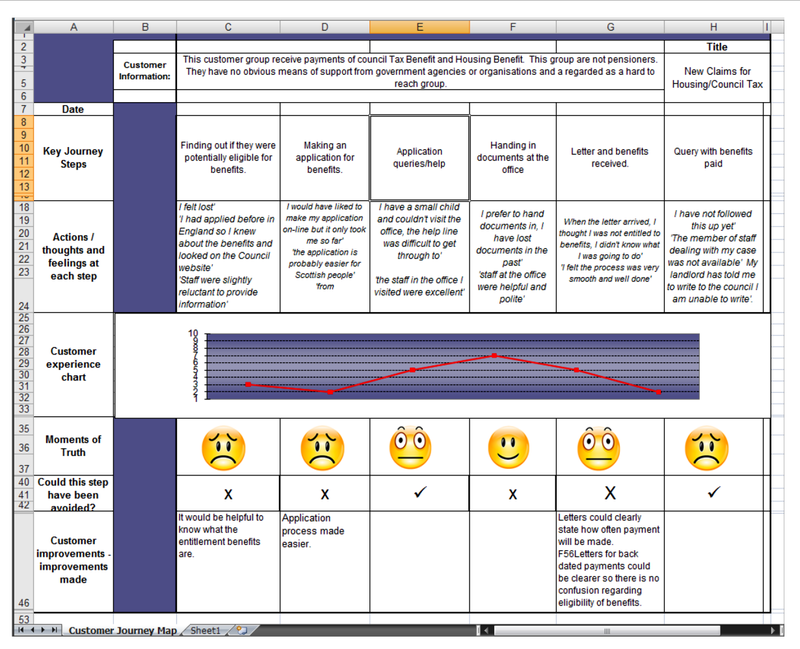 Now you have detailed the pain points (and the successes), you can also reflect your customer emotions. While some of this might be dictated by the quality of your service, some other emotions may be a result of the scenario the customer finds him/herself in and the goals he/she wishes to achieve. 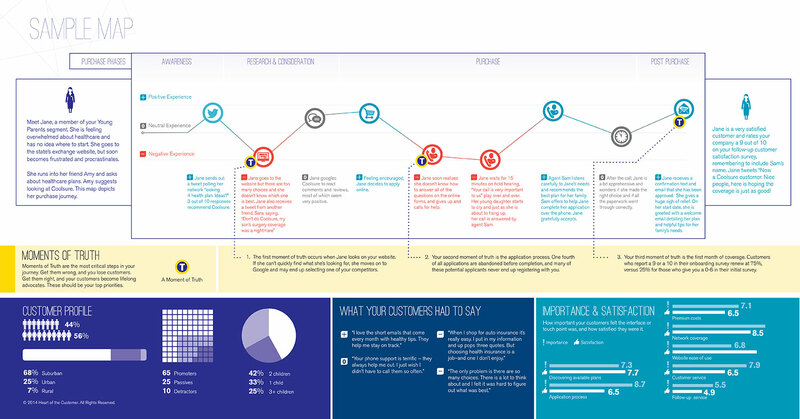 This infographic from interactionsgroup details customer emotions (‘frustrated’, ‘overwhelmed’, etc) and how they move from ‘negative’ to ‘positive’ throughout the journey. The more comprehensive the map is, the more likely it is to accurately represent the customer’s journey, and the higher the probability that you will be able to identify areas for improvement. Therefore, any additional details that could provide insight into the journey should be taken into consideration for inclusion. This could include examining whether a step could have been avoided or, as in the example from Heart of the Customer below, how long each stage would typically take for the customer. Remember, the map is a means to an end, not the end itself. If the map doesn’t result in actions being taken, then it has been a waste of time. Therefore, it is important that as the map is being filled out, and pain points and opportunities for improvement are being identified, that these are charted. As an example, this sample map from the Smart Cities project, demonstrates how Edinburgh Council surfaced a number of areas that could be improved upon during their mapping process. Excellent article thanks Neil. Nice to see a bunch of leading examples of what we find to be an valuable approach. Thanks for the maps and pointers Neil - instructive. I wonder how online accounts fit into this. Multiple "steps" in the journey can take place through a customer-controlled online account with the service provider (from initial research through to downloading paid invoices). Having a good interface is a powerful way to improve the experience and something many businesses could invest more in. Good and helpful post. Thanks Neil. This is a great post with some valuable tips.